S.A.M. not only saves you money by absorbing free energy from the sun, but S.A.M. can also save you big money at tax time! By adding the S.A.M. option with your new CXR or NXR mower purchase, you may qualify for the 30% Federal Solar Tax Credit (not a deduction, but full credit) from the value of the solar equipment and Green Lithium LEM batteries. Tax credit savings of up to $5,518.50 are possible with the fully equipped CXR-60 industrial mower package and up to $2,158.50 for the Nemesis. S.A.M. can save you up to $9,418.50 in your first year of ownership for the CXR or up to $2,684 in savings for your first year of Nemesis ownership! See below for a complete explanation of costs. Energy collected from S.A.M. is immediately converted to power to assist mowing operation of the pure electric CXR or NXR mower. Compared to one inefficient gas commercial mower, one Mean Green CXR electric mower can reduce exhaust emissions equivalent to removing about 141 cars from the road per year! Even the Nemesis can reduce emissions equivalent to removing about 15 cars from the road per year by mowing just your 5 acre lot! S.A.M. provides shade and shows you are doing your part to help save our environment. With the flexible solar panels positioned directly above the operator, protective shade from the sun’s harmful rays is provided. Operators stay cooler and can work longer when not exposed to the high heat of the sun. 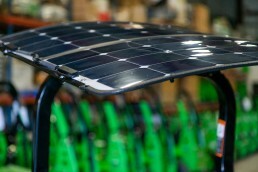 The obvious solar cells on top of the solar canopy also show any on-lookers that you are partaking in sustainable mowing. Commercial operators have a distinct competitive advantage with the CXR and homeowners will be the envy of their neighbors with the Nemesis. Start saving now with easy monthly financing payments that will put money back in your pocket from the first day of use. Estimated savings after first year. 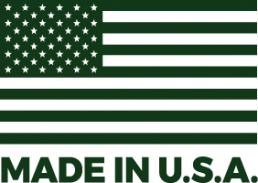 Mean Green Products, LLC and any associates are awesome mower builders, but we are not professional tax or legal advisors. As such any information provided on any page of this flyer/website regarding possible energy tax incentives (credits, grants, rebates) is not to be construed as a guarantee of any kind of the applicability or eligibility for Federal and/or State tax incentives (credits, grants, rebates) for your particular project. Nothing contained herein is to be considered or to be relied upon as professional tax or legal advice. Please consult with your professional tax or legal advisor for the applicability and eligibility for Federal and State energy tax incentives for your situation. 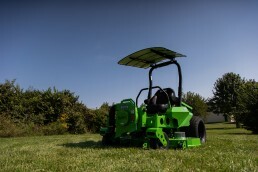 Make your electric mower a solar electric mower! Mean Green’s 200W Solar Panel is the perfect addition to the Nemesis-48/52, CXR-52/60, or just mount it to your home or trailer for an additional power source. With the 200W Solar Panel mounted to the Nemesis-48/52 requires ZERO electric at all! The power from the solar panel will be able to charge the Nemesis’ battery and make it net zero.